The Lady’s in the Closet! | Carol Sheldon writes books exploring times-past through mystery, love, betrayal and murder. The Lady’s in the Closet! 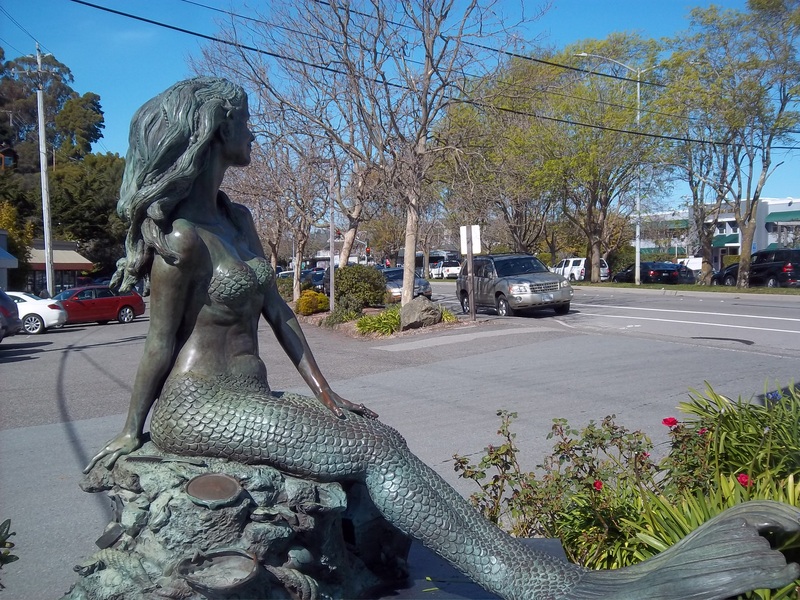 SAUSALITO has a lovely bronze statue of a mermaid.She is hiding behind a Shell Station sign in mid-town. The sign says she is waiting to go downtown. My understanding is that she had built it with full expectation that she be placed on the ‘point’ in Gabrielle park, where many locals and tourists gather to listen to band concerts, enjoy picnics and the view of the Bay and SF. It would be a lovely home for her near the water, where she no doubt hopes to return home. But the powers that be don’t thinks she looks the way a mermaid should—breasts covered in scales, resembling a bra. “Mermaids have to be naked,” they insist. Well, what happened to individual artistic style, artistic licence, expressionism, etc. I for one would love to see her come out from behind the Shell sign and show her stuff in Gabrielson Park. That’s where she belongs, where she can be seen and appreciated by many. As of now she is one of the hidden treasures of Sausalito. This entry was posted in California, human rights. Bookmark the permalink.